The Russian River Jazz and Blues Festival takes place Saturday–Sunday, Sept. 10–11, Johnson's Beach, First and Church streets, Guerneville. $55 and up. russianriverfestivals.com. This weekend marks the 40th anniversary of the Russian River Jazz and Blues Festival. It's been a long, jazzy trip, all right, yet despite some name changes and the recent integration of the previously separated jazz and blues weekends, the festival has remained a fixture of Guerneville's summer schedule and has retained its status as the biggest party on the Russian River. Before you go out to Johnson's Beach this weekend, Sept. 10–11, and hear the soulful sounds of headliners like Chaka Khan, Jonny Lang, Sheila E, Keb' Mo' and many others, travel back in time as we revisit Russian River Jazz and Blues festivals of old . . . The year was 1976. America was celebrating its bicentennial. The new Concorde jet was cutting the travel time between New York and London to three and a half hours. Gas cost less than 60 cents a gallon, though a Zenith 25-inch color TV ran to almost $600. It was the year that Steve Jobs and Steve Wozniak established the Apple Computer Company and IBM introduced the first commercial laser printer. It was also the year that the Russian River Jazz Festival began as a locally produced event with a goal of boosting tourism. When a 1976 drought preempted Guerneville's annual Fire Mountain Pageant, barber and musician Clive Hawthorne proposed a jazz festival to replace it. Sonoma County supervisors granted the Russian River Chamber of Commerce $10,000 to make it happen. That first festival featured trumpeter Dizzy Gillespie as the main attraction and brought some 3,000 music lovers to Guerneville's Johnson's Beach. According to news reports of the time, it was an artistic, though not a financial, success. For several years, a committee of locals ran the festival, eventually hiring a succession of paid directors. The festival featured such luminaries as Count Basie, Carmen McCrae and Etta James, filling out the two-day bill with lesser-known performers, including area musicians like drummer Benny Barth and pianist Bob Lucas. 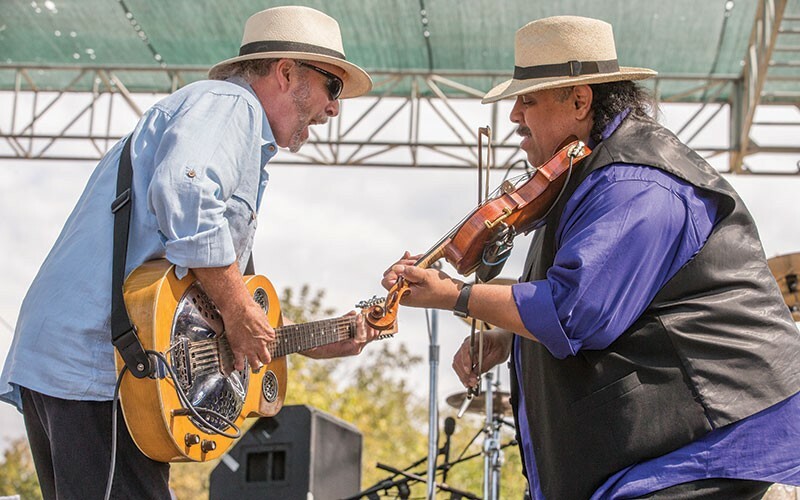 The blues festival was first added to the summer schedule in 1996 as its own musical affair, discontinued three years later, and then revived once again in 2002 when talent agent and festival board of directors' member Lupe DeLeon took over operations. 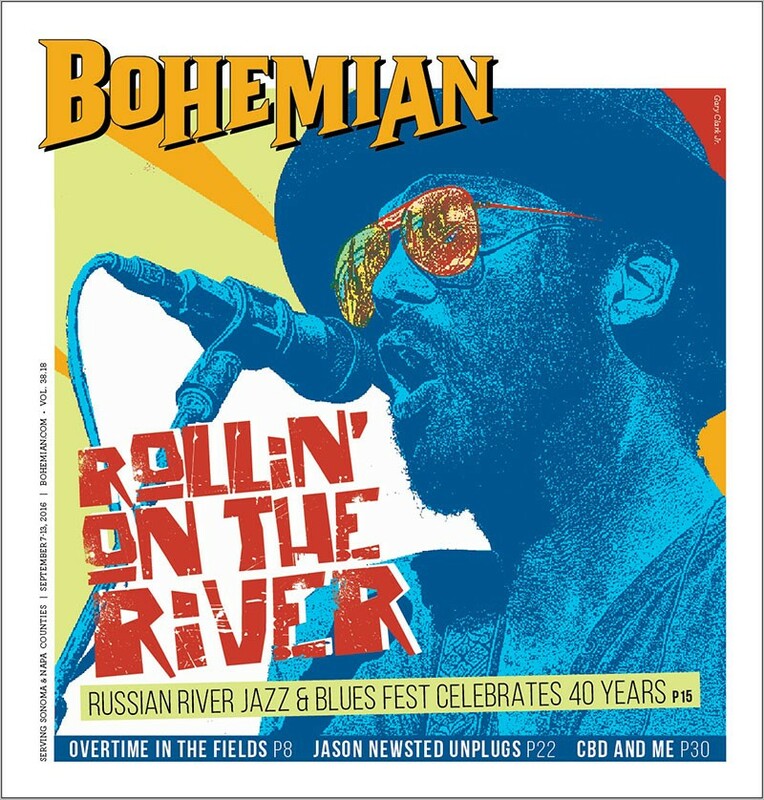 The Russian River Blues Festival typically took place in June; the jazz festival, briefly renamed "Jazz on the River" by DeLeon, happened in mid-September. In 2007, Omega Events took over the festivals from DeLeon, who was suffering from health problems. At the time, it was still two separate weekends. Aside from joining the two events into one packed weekend, Omega Events president Richard Sherman says not much has had to be done in the way of updating the festival. His theory, in short, is that if isn't broken, don't fix it. Based in Southern California, Omega Events was already producing concerts in and around Sonoma County when the company was approached by local partners. "The first meeting we had was with the owners of Johnson's Beach, Clare Harris—who was at the time in his 80s—and his family," Sherman recalls. "He made a handshake deal with us that he would give us the beach as long as we produced good events, and we lived on that handshake deal the whole time." THEY GOT RHYTHM Roy Rogers & the Delta Rhythm Kings lay down a tune at the festival’s outdoor stage. Harris and his family bought Johnson's Beach in 1967 and ran it with great affection for nearly half a century. Last year, at the age of 94, Harris sold the landmark beach to new owners Nick Moore and Dan Poirier. At the time of the sale, the San Francisco couple noted that they had a deep bond with the beach, and said they would continue to host the Russian River Jazz and Blues Festival there. "We learned in our first year here that these festivals are entrenched in our community," Sherman says. "It's really the community's event more than it is ours, that's how we look at it. So we try to do the best job we can every year, and we try to represent the history of the event as well as we can." Sherman and company have kept the festival's tradition of welcoming headlining acts to the river intact. Past legends like Etta James and Al Green signified the festival's traditional roots, and recent headliners like Buddy Guy and Robert Cray have carried that aesthetic along. Sherman notes that they've also reached out to other crossover artists to expand the festival's lineup and have hosted musicians like Boz Scaggs and the Doobie Brothers in the last decade. The design of the event, a two-stage festival on the water, remains unchanged. Kayaks, boats and rubber tubes still occupy the river, and the beloved wine garden and popular food and craft vendors keep the flavors international. "If somebody came to the event 20 years ago and came this year, it probably would look very much the same, and that's part of the charm," Sherman says. "Johnson's Beach as a whole still feels that way, like a throwback in time." Citing the communal nature of the festival, Sherman relates a story about the "Year of the Mud" as he calls it. Three years ago, in 2013, it started to rain the day before the festival. When staff showed up Saturday morning, they came across mud—a lot of mud. The sand and silt of the riverbed had mixed into what Sherman describes as a "chocolate mousse mud," and the venue was nearly impassable. "What happened was, all the neighbors, a couple of ranchers, guys who had access to hay and flatbeds, just jumped into action," Sherman says. "We drove trucks through the venue, throwing hay bales off of it. Then people with pitchforks started breaking it up and we were putting it everywhere. It happened organically and it happened with the help of the community, literally the president of the chamber of commerce was out there. People we had and hadn't met, everyone chipped in." Sherman also carries with him countless musical memories, such as the last year B.B. King graced the festival's stage, sitting in with Buddy Guy for a spirited set in 2011. "You think back on it now, it was pretty special," Sherman says. "B.B. King was talking with the audience all day; it was really kind of a victory lap to some degree, even though he would keep playing for a few more years. And the reverence that Buddy Guy had for King, to see that in Guerneville, a set that may only happen in New York City or Los Angeles, was really something. "I think we've had a lot of those moments over the years on the Russian River, and the community can be proud of that."